John Carmack has outlined the direction he'd like to take the Quake series in the future, explaining to Eurogamer that there are factions within id Software that want to abandon the Strogg-based storyline of Quake 2 and Quake 4. Carmack was adamant that the comments were purely speculative, however - there's no Quake title currently in development. Quake was the first game to feature true three-dimensional FPS gameplay. Carmack suggests that it is not that good of a game, however, and says it's only remembered fondly because of the nostalgia. id Software is currently working on Doom 4 which will purportedly go back to the original Doom-style gameplay as opposed to the more horror based style of Doom 3. Do you have rose-tinted memories of Quake? Let us know your thoughts in the forums. 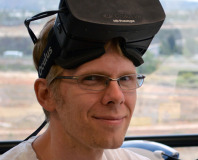 Id co-founder John Carmack has taken a full time CTO role working on the Oculus Rift. 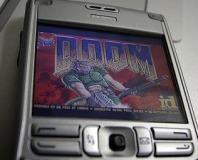 John Carmack states that mobile gaming is the future. Crafty coders have updated the mobile phone version of Quake 3 for Nokia phones so that games can now be hosted from a handset.